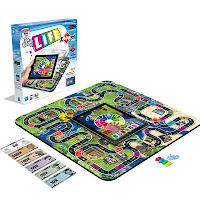 Hasbro's iPad/board game based on the classic Game of Life has garnered an official endorsement from the Parent Tested Parent Approved media group. Everybody has played the Game of Life at some point, but now the board game that we all grew up with has gone high-tech with the inclusion of Apple's iPad in The Game of Life zAPPed. This particular version of The Game of Life is called 'zAPPed' because is requires an iPad and (free) APP download. See? Make sense now doesn't it? I got the chance to see the game in person at the New York Toy Fair last February and it really is a pretty fun time, if for nothing else than the novelty of seeing a big old iPad sitting in the middle of the board. Mainly, the Pad works as the spinner, moving you around the play field, just like the little plastic spinner that we all grew up with. But it's when you land on one of the 'video' spaces that the real fun starts, you'll unlock a clip (which will play on the iPad) from the America's Funniest Home Videos TV show. The clips work as wild cards, bringing good or bad luck to the player who activated them. It's good fun and really adds some new life into this oldie but goodie. Getting the PTPA seal is a nice accolade for the game as well as the product's maker, Hasbro. Parent Tested Parent Approved definitely goes a long way towards making zAPPed a lot more attractive to perspective buyers that are looking to make family game night a little more high-tech (and a lot more attention grabbing for the kids). You can grab a copy of The Game of Life zAPPed right now on Amazon, or through Hasbro's own site. PTPA Media (as a group) is comprised of parents who test and rate products from just about every section of the marketplace. Items as varied as iPhone cases, Roomba's, and antivirus software have all been given the once over by the site. Check them out (or become a member) here.